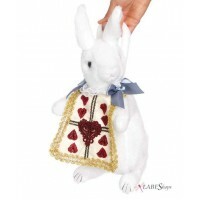 Go down the rabbit hole in this cozy and comfortable White Rabbit costume. Cozy fleece zipper front White Rabbit dress with bow tie has attached fuzzy ear hood, tail, and attached velcro cross body pocket watch detail. A comfortable, easy costume for cosplay or Halloween. Item Number: LA-c85591 | Approximate Size (Inches): 10.00 wide x 3.00 deep x 14.00 high | Approximate Shipping Weight: 2.00 lbs.